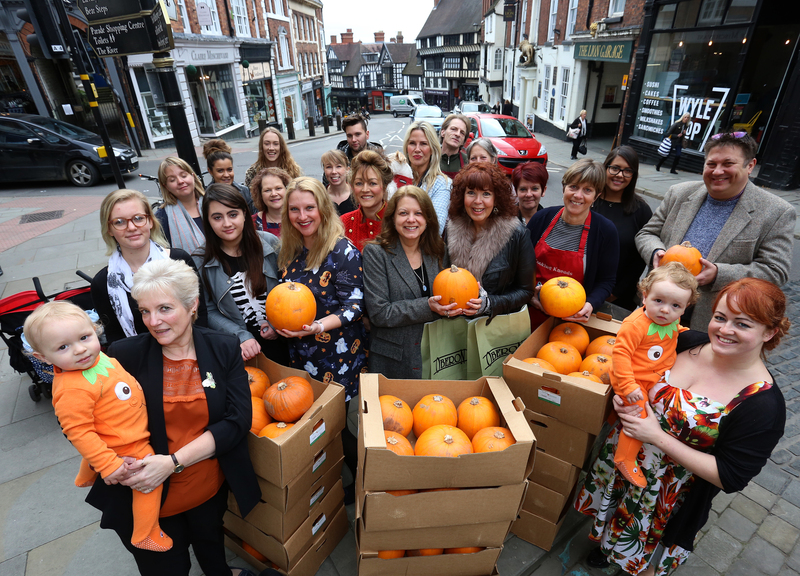 Independent traders on Shrewsbury’s Wyle Cop are to embrace the spirit of Halloween with a pumpkin window display competition. From jack-o-lanterns to modern twists on the tradition, businesses can use their creativity and imagination to carve out pumpkins to be showcased in their shop windows. BBC Radio Shropshire presenter Jim Hawkins will be judging the entries on Tuesday 24th October and presenting the winner with a trophy provided by E & J Jewellers. The carved pumpkins will remain on show for a week until Halloween, Tuesday 31 October, to catch the eye of shoppers. The competition is the first of several events organised by the Wyle Cop traders to celebrate their status as the longest row of uninterrupted independent shops in the UK. The group are taking delivery of around 100 pumpkins from Shrewsbury’s Pomona Grocery so they can be sculpted and shaped to great effect. Trish Donovan, owner of Vinterior and a board member of Shrewsbury Business Improvement District (BID), said: “With a town as individual as Shrewsbury we are sure to see some amazing creations. Wyle Cop is well-known for its array of independent businesses that offer something different.